Hey Sorunome, congrats on the release. It looks really nice! Has DJ_O seen it yet? I'm sure he'll be thrilled! Also, remind me again, what are the specs on the Gamebuino Meta? I'm also curious about the size, how big is that thing? It looks pretty tiny. Thank you! Soru isn't sure if xlibman (DJ_O) has seen it yet. The Gamebuino Meta has the same specs as the Arduino Zero: ARM Cortex-M0+ / 32K RAM / 256K Flash / 48MHz. In addition it also has an SD-card for stuff. And after about a year of development the color remake is finally done, including music, sound effects etc.! Axe / Re: More dynamic variables? That is in most cases not desirable: saving temporary data that you will erase later is wasteful, and you could end up with unpredictable initial state in your program because of that. Hmmm couldn't you solve that in theory by clearing your temp. areas upon program start and upon program exit? That is so freaking cool! How can I get or make a gamebuino? Did you read the title correctly? Yes you did! I am re-making Reuben Quest: Lost Between Times in color! Now, what platform is that for? It is being developed for the Gamebuino META. Enough talking, do you like screenshots? I like screenshots! This re-make also utilizes sound and changing ambient light! 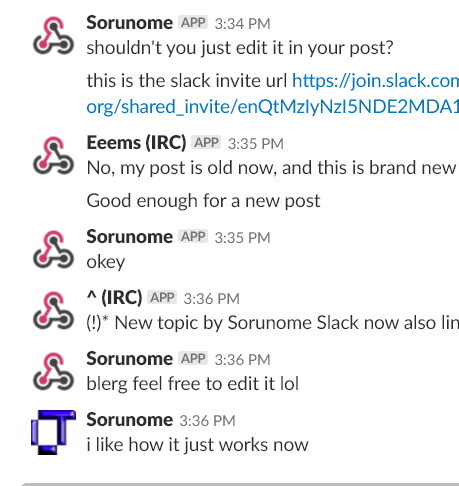 News / Re: Discord and Matrix linked to IRC. Woohoo, thank you to everybody who voted for me in the POTY! :Text "You found # "
The axiom Fullrene should allow you to bypass the 8KB program code limit. There are mixed reports of its efficacy, though. Also, the program needs to be launched from a shell, as the OS simply refuses to launch programs this large. Alternatively, compile your code as an application to get a bit under 16KB of room, although this may not be desirable for other reasons. Interrupts being enabled or not should have no bearing on this. Fullrene uses interrupts to disable the limit. If you read the source, you will see that it uses the I register for interrupts. I know that zStart has a hack to disable the limit, but I don't know if it simply removes the limit firm the OS itself. I don't know about crabcake. I couldn't find a download for it anywhere. Compiling as an app is not an option for me currently for various reasons. It uses the i register as part of the logic to disable the code limit, but it does use interrupts or the i register after that. The limit is not removed permanently; it is only removed for the remainder of the program's execution. I thought it sent some magical number to some magical port? I remember a really old news article about this by 'thepenguin' (?). Which limit the CPU execution in the upper and the lower direction. Now, as you can see on wikiti, both ports are protected. That means that you can't simply change their value, you first have to "unlock" your calculator, so-to-say. The TIOS itself can unlock the calculator but, well, re-locks it before a program has control again. Crabcake, zstart and thelike use TIOS bugs to gain access to the protected ports while running. I am experiencing the same bug as Xeda112358. When I try to use an item in a battle, first the game freezes and the grayscale stops working (only black and white). After a few seconds, the screen clears and "error:link" appears. After that, I have to reset the ram for my calculator to behave properly (garbled screen, etc.). I even saw a blue line of death once. I have a ti-84 plus with 2.55MP. Are you on the latest Reuben3 version? Which item did you try to use? Writing back into flash after erasing the sector is probably also a matter of looping+stack? However, I can't even get FlashToRAM to work. Since I want to copy page 1, I assume the source address is 0 and number of bytes is $8000. But I don't know where in RAM I should put the copy. Especially because RAM can only hold ~24000 bytes (sector size ~32000); I guess I'll have to use the archive? Oh, right, the flash command won't accept any write comments unless you cleared hte page first.